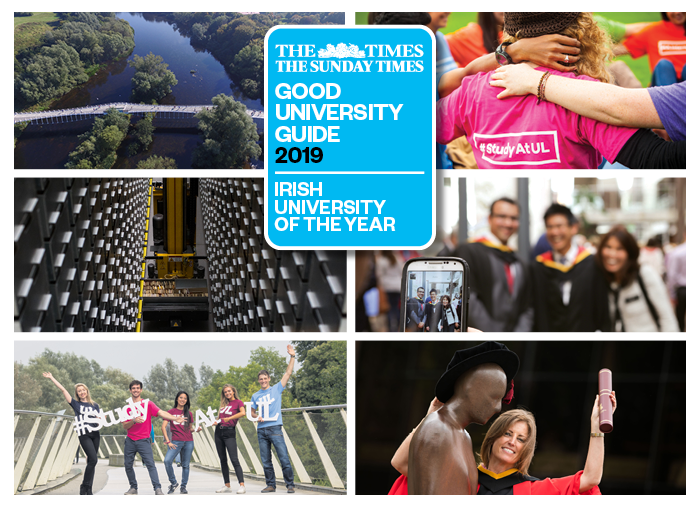 University of Limerick is ‘University of the Year 2019’ in the Sunday Times Good University Guide. UL’s leading position in graduate employability, its cooperative education and internship programmes, its research in partnership with industry and the opening of the €31million new Glucksman Library were among the many reasons for the award. UL previously claimed the title of Sunday Times Irish University of the Year in 2015. Alastair McCall, Editor of The Sunday Times Good University Guide, said: “A second success in five years for our University of the Year is well deserved. The University is at the economic heart of this midwest city and the wider region, attracting brains and resources in equal measure. Its graduates are among the most employable in Ireland, prepared for work by practical courses and a work placement and internship programme second to none, which spans 1,600 employers at home and overseas. "The University of Limerick's excellent results in the annual Irish Survey of Student Engagement suggest its students appreciate their good fortune to be studying at an institution with both an excellent academic reputation and an eye firmly on the working world, for which it prepares its students so well." Dr Fitzgerald highlighted the continued demand for UL graduates by employers; “UL's graduate employment rate for 2017 primary degree-holders is now 79%, 17% higher than the HEA’s most recently-available national average figure which is 62%. A further 18% go on to postgraduate studies”. The new Glucksman Library at UL has doubled in size and capacity this year having added an extra 7,600 sq. metres to the original library building. The library now includes a range of world class innovations in book storage and retrieval, digital research, accessibility and ‘inspirational learning spaces’. One stand out feature is the ARC (Automated Reserve Collection) - a 10 meter high book vault and robotic crane, with the capacity to store 500,000 volumes in a space 1/9th of conventional shelving, which will see UL’s historic collections, currently housed off-site, returned to campus. The University has just seen the highest ever attendance at its Open Days last month when 13,860 visitors came to campus over the course of two days.